Note: Also known as Heavenly bamboo, Sacred bamboo, Chinese sacred bamboo. Despite the common name, it is not a bamboo at all. 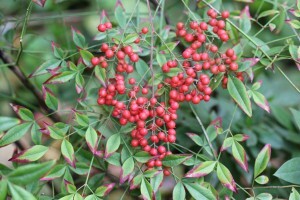 It is an erect shrub growing to 2 m tall, with numerous, usually unbranched stems growing from the roots. 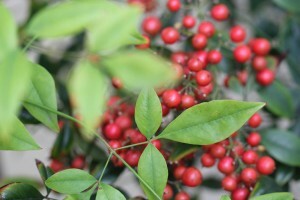 The glossy leaves are evergreen (sometimes deciduous in colder areas), 50–100 cm long, bi- to tri-pinnately compound, with the individual leaflets 4–11 cm long and 1.5–3 cm broad. 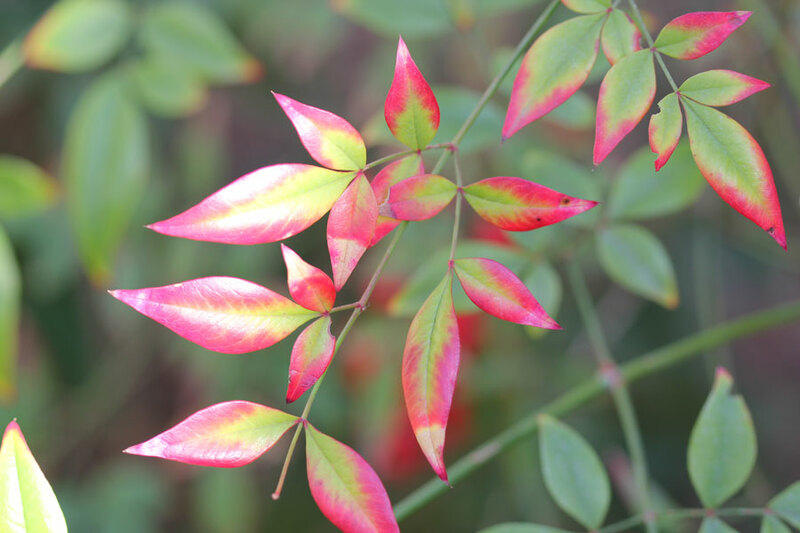 The young leaves in spring are brightly coloured pink to red before turning green; old leaves turn red or purple again before falling. 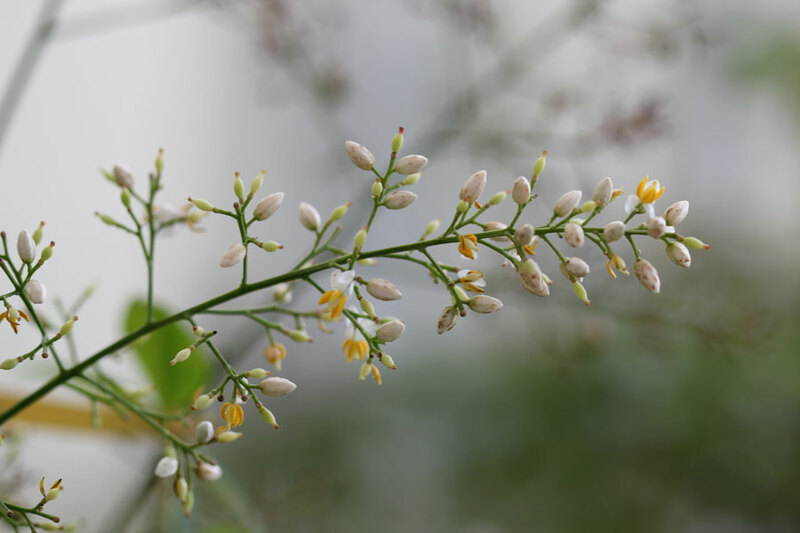 The flowers are white, borne in early summer in conical clusters held well above the foliage. 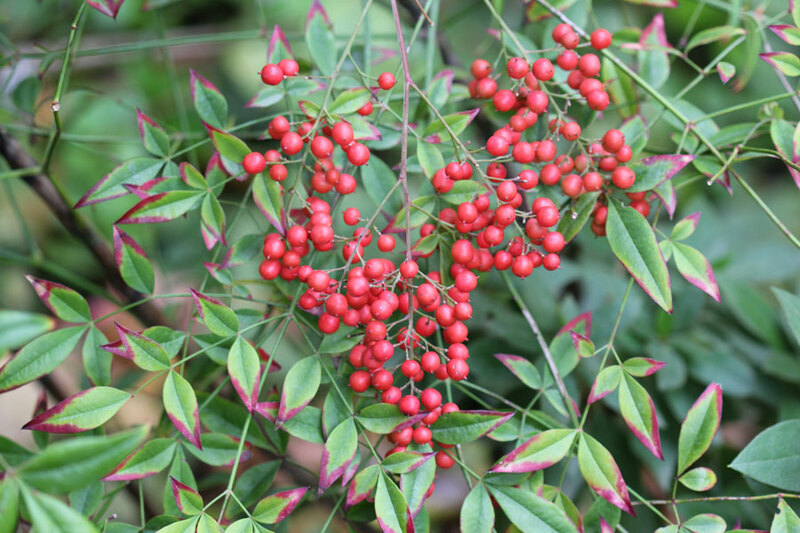 The fruit is a bright red berry 5–10 mm diameter, ripening in late autumn and often persisting through the winter. Fruit / flower: The insignificant flowers are white, borne in early summer in conical clusters held well above the foliage. Foliage description: The glossy leaves are evergreen (sometimes deciduous in colder areas), 50–100 cm long, bi- to tri-pinnately compound, with the individual leaflets 4–11 cm long and 1.5–3 cm broad. Foliage colour: The young leaves in spring are brightly coloured pink to red before turning green; old leaves turn red or purple again before falling. Light preference: Sun to part shade. Soil requirements: Plant in moist, but well-drained, soil. Fertilisation: Will benefit from fertilising.